Disregarding my "pulled back tightly to bear the wind" hair and squinting-more-than-normal eyes, let's talk about the obvious: for the first time on this blog, and the first time in who knows how long, I am wearing shorts in these photos. I fought it, I really did. I actually was wearing a dress when the day started, but walking back and forth to my dorm in heavy winds was not working out. After much frustration with holding onto my dress in hopes of not flashing the entire campus, I finally gave up and changed into these shorts before my club meeting. I usually hate how I look in shorts and was expecting to trash these photos when I saw them, but I'm surprisingly happy with the results. I'm convinced it's the top. It possesses the power to make any outfit look good. Obviously, tights weather didn't stick around for too long, but it hasn't been too bad so I can't complain. I can't believe how behind I've been on everything (posting, commenting on blogs, fashion week, etc. ), I've been so busy. It was so nice to actually have some time to call my parents today, I've even been neglecting them. I love being busy, but I'm looking forward to some down time this weekend. I'm also hoping to write some more as I've been feeling a bit uninspired when it comes to contributing to my section. I did write a column for our Opinions section for their "why my major matters" series on Fashion Merchandising and it's been nice to see the reaction from some of my peers in my major. I essentially ranted (as I always do) about how too many people label fashion majors as dumb or superficial, which is, of course, not the case. For the most part. I also did a how-to speech in my public speaking class on how to start a blog! I mostly chose that because I realize that my hobbies and skills include writing and watching movies/tv shows and it was the one thing I could think of to teach people about. I've also gotten in the habit of trying to convince everyone in my major who dresses well to start a blog. It's strangely become my mission. I succeeded in getting my good friend Justine (who helps me with a lot of my photos) to start one, and I'll share it with you all once I get her permission. Then, as I've said before, it's your job to follow her, whether you like her or not. But let's be honest, you'll like her. She's friends with me so it would be impossible for you not to, right? As usual, I have to mention the blogger's clothing swap group (you know, the one I've yet to contribute to myself) once again until someone tells me to shut up. It's growing slowly, but it's still tiny, making it hard to be successful. Want in? Just add me on Facebook (Elana Katz) and I'll add you to it. I'm a good Facebook friend (and some would even say real life friend), I swear. Shorts are a great look on you! As is the color mustard yellow. And white loafers, too. All in all, I love this outfit. And I know how you feel about being busy. I'm crossing my fingers I'll find the time to catch up this weekend! The top is adorable and rather retro. Plus, just a great color. But the shorts... maybe its the belt, I don't know, but your waist looks TINY! Like, Barbie doll tiny! Also, your legs looks longer (because more is exposed, i suppose, but still.) Yet you retain a classy, casual feel. I think the outfit looks great on you, and I'm loving that shirt, the color, cut, fit, perfect! I love that top! I would've guessed it was vintage if you didn't say otherwise. Those shorts look great on you, nothing wrong with taking advantage of these last few warm days! Happy last day of summer! Love the mustard and navy together, and that blouse is SO pretty! You look adorable. I love your top, the color and the collar (ha) are so cute. You look so cute! I love that blouse, You look great! I love the whole outfit. Perfect pairing! the mustard color looks great on you and I love the peter pan collar! This is such a perfectly put-together shorts outfit Elana! I love everything about it and I too am a dress kind of gal myself. Every so often I venture into shorts territory though. That little mustard peter pan top is darling! I seriously can't wait for this swap group to grow and grow, such great idea and..I know it will :) Happy weekend lady! oh my giddy goodness! 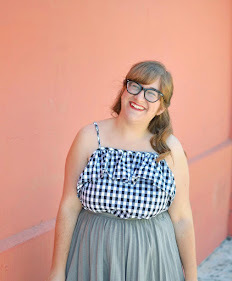 i actually oogled that blouse on modcloth, but I saw a few bad-ish reviews that perturbed me. however, this post has me regretting turning away from it. oh, you look gorgeous! super cute ring. Ahh a mix of navy and mustard - perfection! And look at you, you totally rocked shorts :) I love them on you! You look great in shorts, shorts with tights for fall posts? That top is too cute for words as is the ring! Hope you get a little time to slow down this weekend. I actually love you in shorts! You should wear them more often, it shows off your little waist. I love that top so much too and the sweater is just perfect with it. Basically just an awesome outfit all around!! I'm glad im not the only one feeling super busy lately! Oh, and I joined the blogger swap but also haven't contributed anything yet. Haha, lame, I know. i love this outfit, you look awesome in shorts! and that top really could do no wrong, i love that collar. and i didn't know you were a fashion merchandising major, that sounds like such a fun study (feeling my jealousy?) And I'd LOVE to meet up in October!! When are you coming in? This top is so very pretty! I hate being so busy that I don't have time for blogs. That's the WORST. But at least you're busy and well dressed? Also I would love to hear that speech! and you should wear shorts more often! Regardless of whether or not it was the top that pulled everything together, you still look super cute in those shorts! Don't try to deny it! These shorts look amazing on you, I really like them! I tend to wear dresses, or my one pair of blue shorts with an elastic waist on the blog. I like the look of shorts and will have them on for like half hour and then be like- this waist is constricting my eating ability, give me a dang dress! Anyway, maybe thats just me, ahem. I also think this blouse is adorable and the ring is SO cute! Hope you're having a beautiful day! ohmygosh neeeedddd that top. and those shorts. and can i have all of this. i want thisssss. ARGH. i'm really excited for you to be my style icon. this is up there in it for me.